A sadly frequent scenario is when a patient presents to the office after an Achilles tendon rupture. Whether playing golf, walking, running, or playing football with their friends or family either a snap was heard or a pop was felt. Beyond that initial feeling, people do not frequently have prolonged pain. Rather, they experience a feeling of weakness or a feeling that their heel is sinking into the ground. 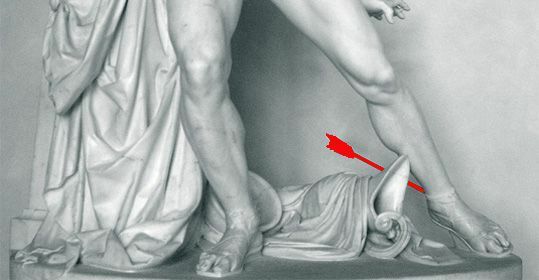 There are other muscles in the leg that help with the actions performed by the Achilles tendon, so it isn't unheard of for a person to walk on an Achilles tendon rupture for even weeks before realizing the extent of their injury. In many cases, our patients admit that they had pain in the tendon previously, that they felt the tendon was tight ... they may even admit that they should have stretched more than they did before and after a workout. The toughest part about an Achilles tendon rupture is that after the injury there are two ways to fix it and both are equally effective, but re-rupture is always a possibility and for some very active people - this injury can haunt them for years and years to come. In simplest terms, it is best to avoid this injury in the first place. When someone suffers an Achilles tendon rupture, the body mounts an inflammatory response (as with anything else in the body) and if this injury goes untreated beyond a week or more, the inflammatory response can lead to further damage of the tendon. This is very difficult to recover from. This is why it is important to be evaluated quickly after an injury to ensure appropriate care is started as soon as possible to get you back on your feet as soon as possible. Depending on the particular person, Achilles tendon ruptures are treated either with casting or surgery. Both tend to recover at the same rate, and there are many studies indicating that re-rupture rates are the same with both treatments. In younger, more active individuals, surgery is typically recommended. Don't put off having an injury looked at by a trained professional. And, equally important, see your local podiatrist if you experience Achilles tendon pain. There are many easy steps you can take to avoid rupturing your Achilles tendon and many of these measures can improve your workout also!